Everything you need to know about ear plugs, earplugs, hearing protection, wearing earplugs, sources for earplugs, or earplugs and motorcycling! Riding a motorcycle creates a lot of noise, even when wearing a full-face helmet. Depending upon circumstances and the helmet’s design, wearing a helmet may actually increase the noise level! I have lost hearing in my left ear and I have a very annoying and constant ringing in that ear and some ringing in the right ear. Granted, it’s not all due to riding a motorcycle — some of it is due to working as a machinist in a very loud shop and some of it is due to a misspent youth in the ’60’s and early ’70’s…but let’s not go there! The fact is that earplugs, when worn properly, can greatly reduce the noise level of riding. 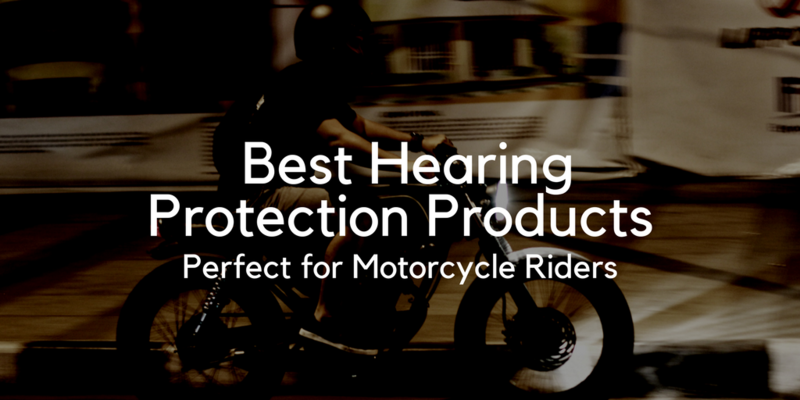 They can help save your hearing and also reduce some of the stresses of long-distance riding. Remember, once your hearing is lost, it is lost forever. 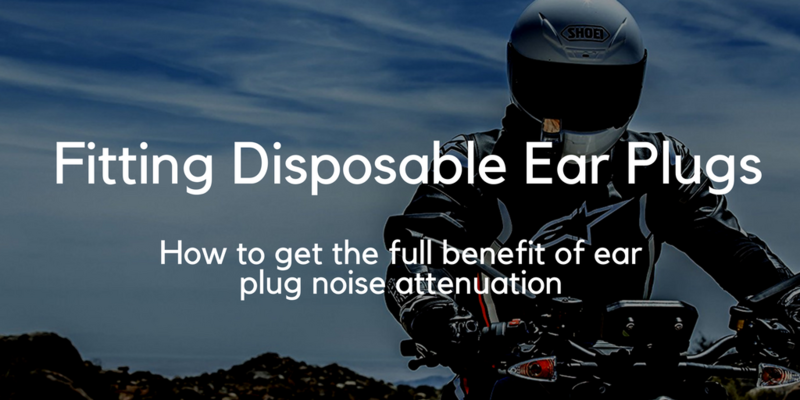 Wearing earplugs whilst riding motorcycles can make your ride much more enjoyable; if you’ve never worn them, you won’t believe how much less stressful it is to ride without wind noise drumming in your brain! And earplugs can make a noisy helmet much quieter. Our team is constantly reviewing new hearing protection products, ensuring that our extensive review database is current and representative of what’s available on the market. Our most recent reviews can be found here. Some people love to dive in and read every review while others like to skip the detail and just find the best products for sale today. If you fall into the latter these are the lists for you. Every year we review, rate, rank and battle test motorcycle products to find the cream of the crop. 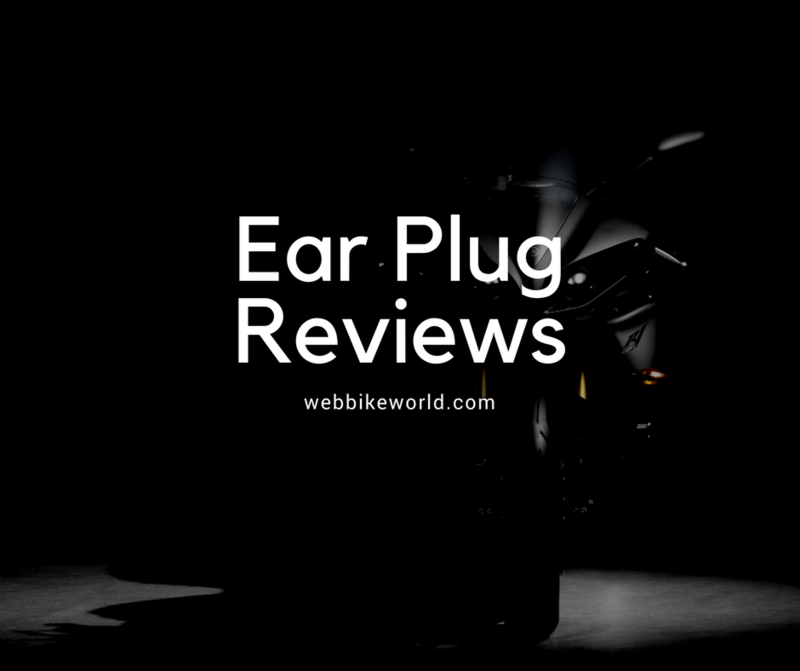 Our best of the best lists showcase the top ear plug products, our top recommendations for motorcycle riders everywhere. 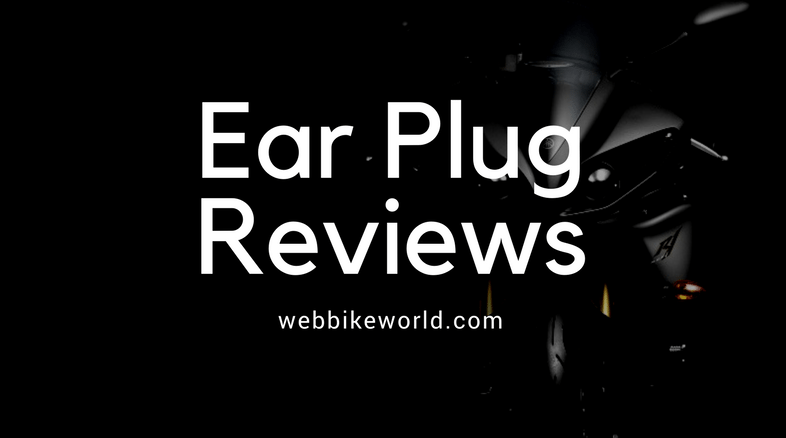 We’re always reviewing new earbuds, earplugs and noise cancelling speakers so be sure to check out our most recent ear plug related reviews here. webBikeWorld has worked closely with RevZilla over the years to provide our testers with products to review. In addition to being a great site to shop from, they’re also a great partner. Both Amazon and Revzilla have a solid selection of heating protection products. It is important to make sure your earplugs are inserted and fit properly, or you won’t get the full benefit of their noise attenuation. Here’s a nice .pdf poster from 3M that illustrates how to wear earplugs. Before fitting any ear plugs, make sure your hands are clean! Hold the ear plug between your thumb and forefinger. Roll and compress the entire ear plug to a small, crease-free cylinder. While still rolling, use your other hand to reach over your head and pull up and back on your outer ear. This is important! This straightens the ear canal, making way for a snug fit. Sometimes it helps to hold your mouth and throat open whilst inserting the earplugs. Insert the ear plug and hold for a few seconds. This allows the ear plug to expand and fill the ear canal. When properly inserted, the ambient sound level should drop way down as the earplugs expand. You’ll feel like the “world’s closing in on you” as some have mentioned. If you can cup your hands over your ears and the noise seems to decrease, your ear plugs are probably not fitted properly. Remove and refit following instructions. Always remove ear plugs slowly, twisting them to break the seal. If you remove them too quickly, you could damage your ear drum! Foam ear plugs are disposable and are not supposed to be re-used, but I usually can wear the same pair anywhere from two to four or so times without problems. John Allen’s interesting page “A Bicyclist’s Sense of Hearing” has some good information on hearing, headphone types and headphone laws. A summary of a study that describes the sources of motorcycle helmet noise. See also our Motorcycle Helmet Noise reference page to learn how to attenuate helmet noise. California at one time was going to pass a law banning earplug use while riding. See the California Earplug page for more information. Recently, there have been reports of California police officers ticketing motorcyclists for wearing earplugs. It was assumed that this was a new law that had recently been passed. But sources have now informed us that this law has been on the books in California since January of 1986! The California law prohibits motorcyclists from wearing earplugs. Our information page has a copy of the law as it is written; can you decipher it? From “P.B.” (November 2015): “I have read your articles on ear protection. I had custom fitted ear plugs before but these no longer fitted after a year of not driving. I went looking for the best disposable earplugs then. The Moldex spark plugs did not fit well in both ears. They did not dampen enough in my right ear. I checked some others and I found the 3M EAR Soft FX to be great. I read that you had the same, that even the bigger Purafit did not fit in your right ear, so maybe these might also fit better. The 3M 1100 37dB SNR were also nice and fit well. They are a bit smaller but still larger than the spark plugs and don’t press as hard as the EAR Soft. I have yet to try the Purafit. They only sell it in large boxes and if they don’t fit that would be a waste of money. The Moldex Contour was also nice. Bigger than the spark plugs but very comfortable because of the design. Fit was better than spark plugs but the SNR of the EAR Soft is just so amazing. My father has tinnitus after a lifetime in the Army and this drove him crazy for a while. So I have always been very careful about ear damage (earplugs on the motorcycle, at festivals and shows, etc). I sadly enough still sustained hearing damage from having a broken helmet (A Schubert C3 Pro that didn’t close good and made a hell of a noise, even with earplugs, during 2 rides). This was enough to cause hearing damage and I now have a flute tone in my ears for about a month now. Helmet was fixed under warranty, my ears sadly enough will never heal. From “D.M.” (02/11): “I have read your earplugs section several times. I really do not like the foam plugs in my helmet due to comfort (for me) and how much sound they block. I have been looking for a plug that will block the “white noise” but still let me hear traffic somewhat. I am a motor officer too, so something that will allow hearing of the police radio, person I have stopped, and traffic around me was what I was looking for. I think someone else also mentioned these plugs, but I have been trying some putty like ear plugs. So far they seem pretty good. These plugs feel kind of like clay that you stuff into your ear to get a custom type of fit. You can push them in a lot for really good sound blocking or a little for partial sound blocking. I have been experimenting some, and so far they seem pretty good. I am not sure if I can get them to where I like for my work, but personal riding I am very happy with them. Downside is that they take some time to get just the way you want if you are looking for the partial sound block. I understand some folks are also using these with earbuds to help hold them in the ear and provide more sound protection. As with anything you have to remember to put them in (which I keep forgetting) but so far I have been pretty happy with this product. I have not tried a true custom fit earplug, but these do seem like something that can get you mostly there without the money. From “D.B.” (8/10): “I’ve used a variety of foam earplugs for many years. At first, I used reusable plugs because that’s what the military provided. I currently have the Howard Leight Laser Lite and think they are as good or better than the reusable and most of the other foam plugs. From “M.D.” (NAM) (12/09): “After getting frustrated with the custom ear plugs available (keep on falling out as my one ear canal is a bit narrow), I went to our local Hearing aid specialist. He injected my ear with a soft silicone (German product) which sets in about two minutes. From “J.R.” (11/09): “I have some comments on your reviews of disposable foam earplugs. I have always worn earplugs when riding. I started out with the E.A.R. Classics – which I would typically wash and reuse almost indefinitely. I tried some of the reusable style earplugs, but none of them work for me. I too have a problem with my right ear canal. In my case, it has an extra bend in it, and if I am not careful, the earplugs do not insert all the way and then they simply do not block the noise. The reusable style plugs do not go in far enough at all. After reading your review of the E.A.R. Grippers, I decided I had to try them. Naturally, this was just after the non-corded version had been discontinued. So, instead I ordered various trial packs and did some experimentation. In my opinion, the “E.A.R Classic Superfit 33” are the best earplugs I have ever tried when it comes to noise reduction. They are so good in fact that I quit wearing them on my daily commute because I felt they isolated me too much. The time I glanced to my left and discovered an 18-wheeler which I had not even realized was there shook me. The problem with the Superfit 33’s are that they are PVC foam not urethane and after about an hour or so, the PVC starts to itch. For regular commuting, I settled on the E.A.R EarSoft FX. Even though they have the same NRR (33) as the Superfit 33’s, they don’t seem to isolate as much. They do a very good job however, and they are comfortable. If I have a complaint, it is that they are softer then the PVC style plugs, and hence more difficult to get inserted correctly in my right ear. Also, I have noticed on a few long rides that they can tend to work their way out. For long rides, I prefer the E.A.R Classic Soft. This is billed as “thermal reactive foam” which gets softer with body heat. This seems to actually work. They are quite comfortable, which is why I like them for longer rides. The complaint is that it can take a little while to soften and expand fully, so I don’t wear them on the commute. I note that I tried the Taperfit II, as well as some of the others you suggest, and none of them seems to be as good at noise reduction as the ones I mention. From “Y.R.” (10/09): “After reading (the Blockade ear buds review) I went after these earbuds. In every single place I found the seller didn’t ship outside US for a reasonable price, I only find one seller that charged the same price of the earbuds for the shipping. Together with the review I read the comments, after I couldn’t find the Blockade earbuds I decided to buy the Etymotic earbuds that one of the comments talked about. They are much more expensive than the Blockades, but the sound quality from what I’ve read was definitely better. On the specs of this earbuds it’s said the NRR is 34-36 dB, I thought there was no way that these could be better than the Purafit 6800,which is what I always use (they have an NRR of 33). When I got the earbuds I wasn’t intending on using than for motorcycling anymore, it’s illegal where I live (Brazil) and makes riding much more dangerous. But just to test, I used it once. To my surprise with the foam plugs the Etymotic ER-6i also comes, it really does block even more noise than the Purafit. The Etymotic comes with 4 pairs of plugs. One with a common cylindrical shape (which is the best), one that is kind like a ball (which you can put without rolling it), this one blocks as much as the Purafit. And it also comes with two sizes of silicon ones, they are good, but blocks much less noise than the foam ones. Oh, and on the only time I wore them, I was hit behind by a car on a traffic light that went yellow and I stopped (kinda suddenly, but not much), I was almost at full stop when I was hit (maybe 2mph) and the car was about 6mph faster, my rear wheel locked and I was pushed forward, but I managed not to fall. From “J.H.” (9/09): “Since I returned to riding a year ago, I’ve learned to go to webBikeWorld.com whenever I think about buying new gear. Recently while browsing through the site I ran across your ear plug review and would like to suggest some plugs that I find comfortable and are great at blocking noise levels (at least for my ears). I have been using Winchester brand Red-E-Fit Foam Earplugs for some time. I used to pick them up every so often at local sporting goods stores, but recently noticed that my neighborhood Lowes carries them. I can’t remember exactly what I paid for a package of a dozen plugs, but it wasn’t more than a few dollars. For my ears I find the Red-E-Fit plugs comfortable and do an exceptional job of blocking out noise. The plugs are soft, pliable, are easily rolled up and do not expand too quickly. From “K” (1/08): “Always enjoy your excellent reviews. I am new to the sport and really didn’t think about earplugs until I began to read information on your sight. I tried many different ones and maybe I have some weird ear canal shapes but I didn’t find anything really comfortable or anything that fit my ears well. I came across a product by Beneficial Products Inc. which claim to be rated NRR 34 and to be the “world’s finest earplugs”. I have been using them for the past several months and for me they have been outstanding. They really block all that noisy air going around in my helmet and the fit is both comfortably and tight. BPI states the product is made out from Beeswax, Cotton and Lanolin.